Answer: Everyone wants to save money on their landscape project but still have an attractive landscape. Landscaping your home can increase the value of your property, beautify your home and neighborhood, and give and outlet to get some exercise, enjoy the outdoors and fresh air. Today many homeowners use lawn services or maintenance companies, but when you care of your own yard, you’ll save some money, improve your physical condition and studies have found – relief stress. To ensure a better-looking landscape follow these few tips to take better care of your yard. Plants just like people enjoy certain conditions – some plants do better in more acid soils, while others like more alkali. Also of importance are the soil types – sandy soil and clay soil, or a loamy soil, can help determine what types of plants will thrive in your backyard landscape. When you buy plants which do well in the soil conditions of your yard, the landscape will look more attractive and the dollars spent on the landscape makes much more sense. If you truly want certain plant varieties which are not suite to the soil type – the soil can be improved. Adding mulch or peat moss, or crushed limestone or clamshells can change soil texture and pH. Space available comes in two forms, the physical space available and the space the plant will grow or need as it matures. Some plant varieties in the landscape will require more room for their root systems. Other varieties can have a tendency to grow everywhere. When selecting in the design phrase or at the nursery make sure you give adequate space for root systems and foliage. If you don’t know – ask. You don’t want to find out some plants get crowded out or choked out and die after planting. Also, make sure you understand the space requirement between plants. Many shrubs and small trees must be planted a minimum distance of three to four feet apart to have adequate room to grow. When planning your landscape look at using native plants in your design. 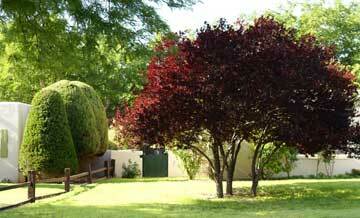 Native plants are very effective in creating a balanced and good-looking yard – front or back. Find out what plants grow best in your area, and what plants are native to the zone or region. You’ll know they can handle the climate and should reduce “culture shock” when planting. If you go the route of non-native plants, make sure they come from an area that shares climate conditions similar to the one in which you live. Flowers can completely change the look of the landscape. 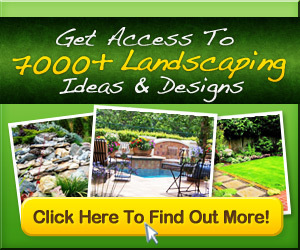 Plan and design your landscape around different blooming times. As plants bloom throughout the year, new focal points will emerge in the garden and landscape. Flowering plants extend the length of time your property will look beautiful. Choose plant material – bushes and shrubs that look attractive even when green, when they flower it’s an extra bonus! It is a good idea to stagger plants among each other. Plant crocus and tulips among later-blooming plants. When the early spring the bulbs bloom lose their luster and the flowers whither, new varieties and types are ready to flower and take their place. This “bloom cycle” crates new fresh looks in the landscape during the seasons by always introducing new colors and textures. Place wood chips or mulch around shrubs, bushes and trees. Wood chips can help the ground look more attractive and give a finished look. The chips not only cover the ground and look better than bare soil and dirt but they help retain moisture, keep weeds down and provide a natural food as the mulch breaks down.